Nordic Academic Press of Architectural Research was founded on 6 December 2016. It is the publishing house of the Nordic Association of Architectural Research (NAAR). Members of the NAAR Board make controlling decisions about which books will bear the imprint of the publishing house. In keeping with the proud traditions of NAAR and its commitment to serve its members and the larger research community in the Nordic countries, Nordic Academic Press of Architectural Research publishes original scientific articles and academic essays on architecture and its discourse. Its mission is to promote scholarly work. NAAR publications embrace the highest academic standards, and books published by Nordic Academic Press of Architectural Research are peer-reviewed following the same rigorous double-blind peer-review system, which is used for the association’s highly acclaimed scientific journal NJAR. Nordic Academic Press of Architectural Research is strictly reserved for NAAR’s own peer-reviewed publications in book form. Books may be written in English or any of the Nordic languages. Together with NJAR, the publishing house forms a unique platform for researchers in architecture in the Nordic countries. 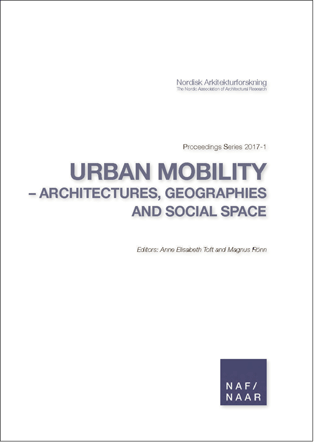 The NAAR Proceedings Series (ISSN 2535-4523) published by Nordic Academic Press of Architectural Research are fully open access books, which means that they are available on the internet to all users immediately upon publication. Non-commercial use and distribution in any medium is permitted, provided the author and the publishing house are properly credited. The series is ranked at level 1 in Norway, Denmark and Finland. The editors of the NAAR Proceedings Series advice their collaborating partners regarding the editorial policy and content of the series. By submitting one's work for review and publication, all authors attest to, and agree to abide by, the COPE code of ethical conduct. This anthology is the proceedings publication from the 2016 NAF Symposium "The Production of Knowledge in Architecture by PhD Research”. With the present publication, the Nordic Association of Architectural Research wishes to shed light on architectural research and its knowledge production by taking a closer look at PhD research. Other books have addressed the same subject, but from different vantage points. Particular to this publication is its interest in pursuing architectural research, and the notion of it, as a social, cultural, and political construction. This anthology is the proceedings publication from the 2015 NAF Symposium in Malmö, Sweden. The aim of the 2015 NAF Symposium “Urban Mobility – Architectures, Geographies and Social Space” was to facilitate a cross-disciplinary discussion on urban mobility in which the juxtaposition of different discursive perceptions of the concept would foster greater insight into and understanding of both the challenges and potentials that it represents. It focused on some of the key themes currently facing cities and the urban: the transformation of the city and our built environment; migration; rural decline; the interaction between city, architecture, and inhabitants; the role of architects and architecture in the creation of democratic and sustainable urban contexts; the city and its representation; the politics of intervention; and the actions of governing and developing. This proceedings publication from the symposium collects six articles written by authors who all presented papers at the event. This anthology is the proceedings publication from the 2013 NAF Symposium "Aesthetics, the Uneasy Dimension in Architecture". Suggesting that critical discussion on aesthetics in architecture and architectural discourse has become marginalized or almost non-existent at many universities and schools of architecture, the symposium wished to address this matter and what it means to architecture and our notion of it. In a self-reflexive manner, it also wished to explore how this influences architectural research and the way architectural research is carried out in different research contexts.